Using a diamond grinding technique, we eliminate the greyish, friable layer and expose the more solid and durable part of the concrete. This treatment is guaranteed to give your floors a remarkable life span. Time will not take a big toll on your floors. 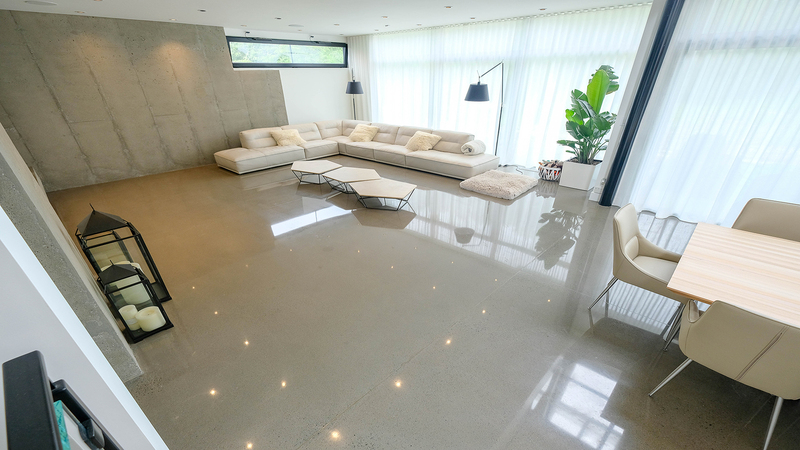 Polished concrete floors are recognized as being long-lasting, hence their status as a noble material. They age well and change very little over the passing years. Concrete is made up of four simple and natural elements: sand, crushed stones, Portland cement and water. Just like preparing a cake, these elements are mixed together inside a concrete mixer. And just like in any recipe, the ingredients that comprise it combine and arrange themselves randomly and naturally to yield a unique result. Even if we master the placement of the concrete slab, each stone and each grain of sand will never be in the same place as in the preceding slab. This uniqueness is reflected in the natural and noble appearance of polished concrete floors, in the same way that knots appear in a hardwood floor. Did you know that it is necessary to leave the concrete slab to cure before polishing it? The « curing » of concrete is an essential step and represents a period of at least 28 days. A new concrete slab cannot be polished as soon as it has been placed. It is necessary to wait for four (4) weeks before polishing it. This period of curing never ends, but it diminishes. Throughout its life span, concrete shifts and cracks may form. The saw kerfs protect the slab by controlling the formation of cracks. For incredible results, put your trust in the know-how of Béton Prestige.